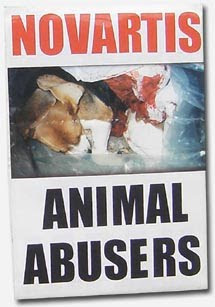 Novartis contracts with the puppy killers at Huntingdon Life Sciences. HLS will test anything for anybody. They carry out experiments which involve poisoning animals with household products, pesticides, drugs, herbicides, food colourings and additives, sweeteners and genetically modified organisms. Every three minutes an animal dies inside Huntingdon totaling 500 innocent lives every single day. Huntingdon Life Sciences is the most exposed laboratory in the world. In recent years they have been infiltrated and exposed at least seven separate times for disgusting animal cruelty and rule breaking. Each time horrific evidence of animal abuse and staff incompetence has been uncovered, including workers punching beagle puppies in the face.